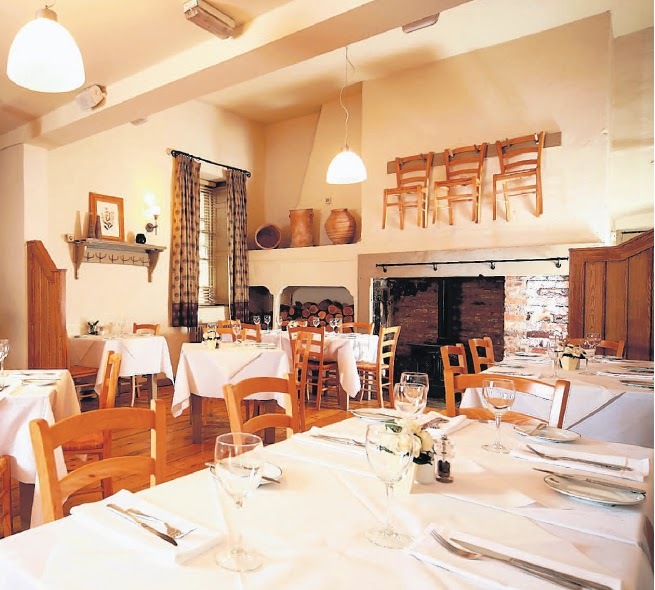 When Terry Laybourne’s Bistro 21 suddenly closed last year, Durham mourned the loss of one of its few good restaurants. 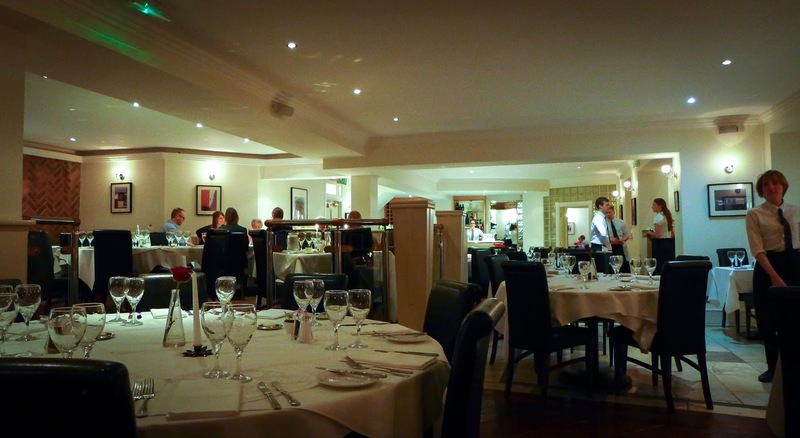 Of all the places in the Laybourne empire, this was probably my favourite, with well-prepared bistro cooking in an attractive, calm atmosphere; in 2014 it won my Bistro/Brasserie of the Year award. 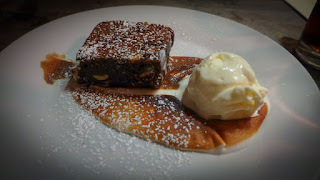 Last month I tried to fill the gap on my Durham listings page by reviewing Finbarr’s, whose food I also enjoyed. A few short weeks later, it also shut down without notice. What is going on in Durham? To misquote Oscar Wilde: to lose one good restaurant may be regarded as a misfortune, to lose two looks like carelessness. It left a city in crisis, with only one serious eatery left: DH1, the excellent but tiny fine dining place. Or so I thought. Because, without fanfare, and just in the nick of time, the head chef behind Bistro 21’s success, Ruari MacKay, is cooking in Durham again. It may only be a modest-looking pub, but the kitchen of The Garden House Inn is humming, and turning out dishes of culinary gold. It so happened that the closure of Bistro 21 coincided neatly with the desire of the pub’s owner, Adrian Grieves, to improve his food offering. He couldn’t have found a better partner to man the kitchen. MacKay is a talented cook, with a light touch, classic technique and a sense of humour. And he brought two of his brigade’s most talented chefs to help him. As a result, the place is heaving. It’s a lump of a building, 10 minutes’ hike up the hill from the train station. Whilst a few standard ales and lagers are on offer, most people appeared to be there for the food. They sat in all the various nooks and crannies of this cosily candlelit space, a younger crowd than Bistro 21’s, and seemingly very happy with what was on their plates. Rightly so. The menu is beyond tempting: there’s a dish of monkfish and nduja, the chilli-spiked sausage of Calabria. Squid is offered not in dull “tempura” format, but partnered by blood orange, mint and chilli. Wild garlic, of which the Durham riverside fairly reeks at this time of year, made a couple of appearances, and who could resist a dish simply entitled “lobster sandwich” (spoiler alert: not me). 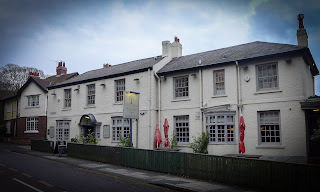 Sure, it’s still a pub, so you can get fish & chips or a burger if you really want to, but why on earth would you when there’s such intrigue elsewhere? 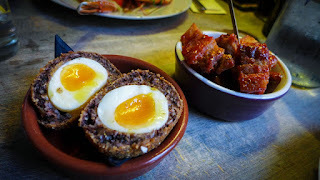 The first sign that this was going to be a stellar feast came, as it often does in good gastropubs, with a superb scotch egg from the bar snacks menu. Delicate crumb, fine haggis shell and, natch, a softly cooked egg. Even better was a plate of Korean fried pork, in which crisp nubbins of pig belly had been slathered in, I think, gochujang and ketchup, then sprinkled with sesame seeds and scallions. This may have been the best and most addictive bar snack I have ever tasted. The fireworks continued with our actual starters. 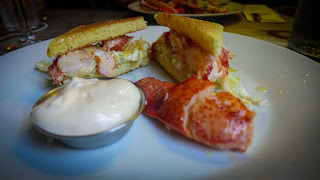 My lobster sandwich was a riotous wonder: perfectly cooked tail meat bound in a decadent creamy dressing, served between triangles of toasted buttery brioche, with a whole claw as a garnish. At ten pounds, this was luxury dressed up as good value. 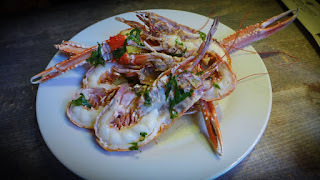 Mrs Diner spotted a chalkboard special of langoustines in butter and wild garlic, which proved to be very special indeed. The pearly white tails were from Scotland’s finest specimens — the meat was so good, we attacked the claws down to the very fingernails. When you have the best produce, a good cook knows that his key ingredient is restraint. This was a restrained triumph. 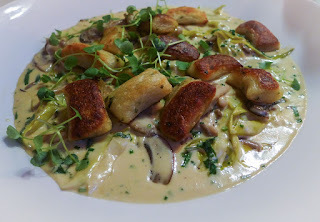 I risked a vegetarian main of gnocchi in order to see how much attention a less obviously popular dish would receive. Beautifully browned pillows of spud arrived swimming on a dreamy creamy wild mushroom and leek sauce. Seasoning here, as elsewhere, was aggressive, but not violently so. Mrs Diner attempted something healthier with her dish of seared tuna, properly purple at the centre — yet more well-judged cooking. Her broccoli had been charred rather than boiled, which raised the vegetable’s status from also-ran to thoroughbred. 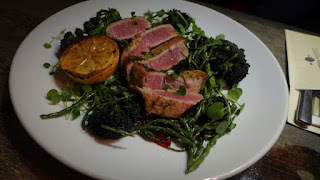 It was joined by samphire, whose salty snap was an equally good companion for the fish. I should pause from lobbing superlatives all over the place to note that the service could do with sharpening up a bit. I had the sense that they may be victims of their own success, the quality of the cookery already bringing the masses through the door (and wait till the rest of Durham reads this review). Some training around the menu and a bit more organisation would help, as would a finger bowl to go with those langoustines. That said, there was warmth and charm from everyone we spoke to, and that’s a more important asset than a knowledge of nduja. We finished by sharing a chocolate brownie that demonstrated a perfect trade off between crisp top and fudgy innards. A swoosh of blowtorched soft meringue on the plate demonstrated the attention to detail that elevates a good repast to a great one. The slightly granular fact that the sugar hadn’t melted properly into the egg whites is as close as I can get to a genuine criticism of anything that we ate all night. The wine list is short, but has some worthwhile entries at reasonable prices. I enjoyed a glass of MOKOblack Sauvignon Blanc to cut through my lobster. Later, a French Mourvèdre was just the thing to see off a wild mushroom sauce. 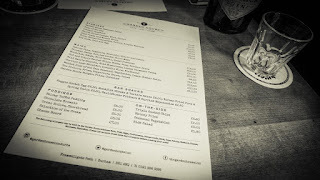 £70 for two people with drinks and service may be more than some people would want to spend on an evening out at the pub, but this was a bargain for food of this quality. I just hope I’m not putting the hex on the Garden House Inn with these words, as I apparently did Finbarr’s. I’m excited to see what comes out of this kitchen as we move through the seasons. 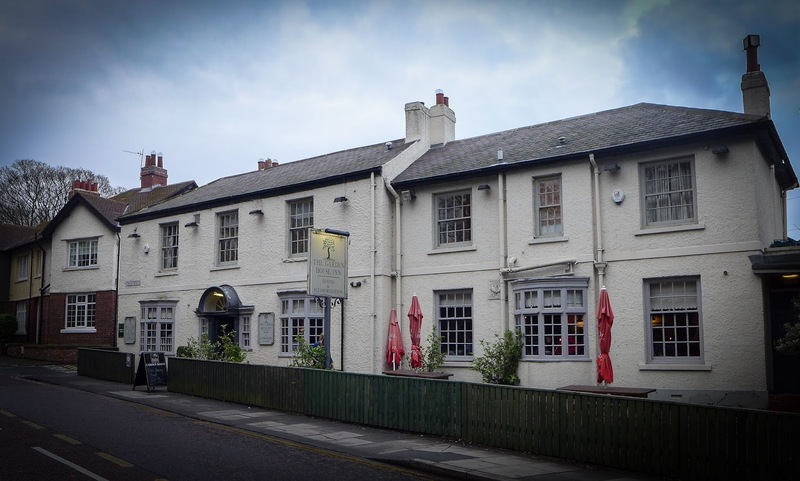 It might look like just a pub, but it has the potential to be so much more than that. Aside from DH1, it is already the best restaurant in Durham by a mile. If Ruari and his team can push on and really settle in, it could become one of the best destination restaurants in the North East. Book now. 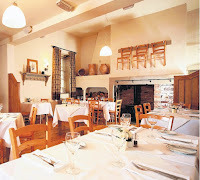 Brilliant food on our doorstep, sadly the staff are poor. The last three times we've been (without booking), the first thing we are told is there will be a 45 minute wait for food.This despite the fact there are quite a few empty tables. (We've walked away twice). We're asked if we've booked, no is the reply. "We have no tables left" Err..yes you have, we're sitting at one.I fail to understand how a much lauded chef who managed to run a much busier restaurant previously (with a larger menu) can't cope with 20 odd covers. Or do we always get the stand in chef? I wish they could sort this out as we love the atmosphere in here and the food is great. Jan 17.